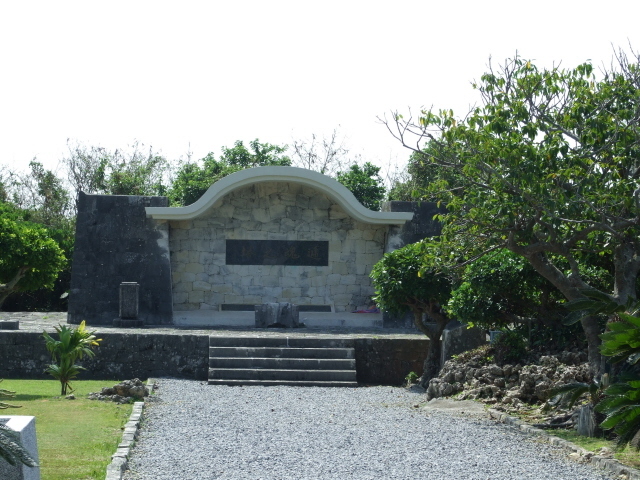 This is the main memorial place dedicated to the Battle of Okinawa (and its aftermath). The complex is huge and a visit here should not be rushed. 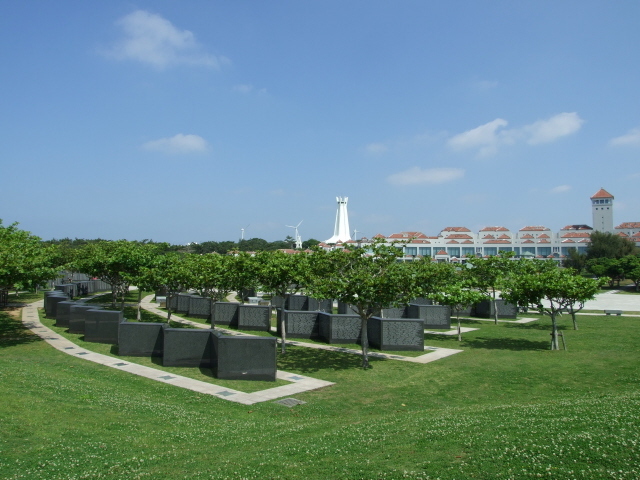 What there is to see: The heart of the Okinawa Peace Memorial Park is its museum, officially called "Okinawa Prefectural Peace Memorial Museum", but around it there is lots more to see, mostly open-air. The semi-circular combined structure of the Museum and the Cornerstones of Peace face a round circular space at the centre of which there is the eternal flame (actually only moved to its present location in 1995). It's right on the cliff edge and from here you get a first good view of the coastline. 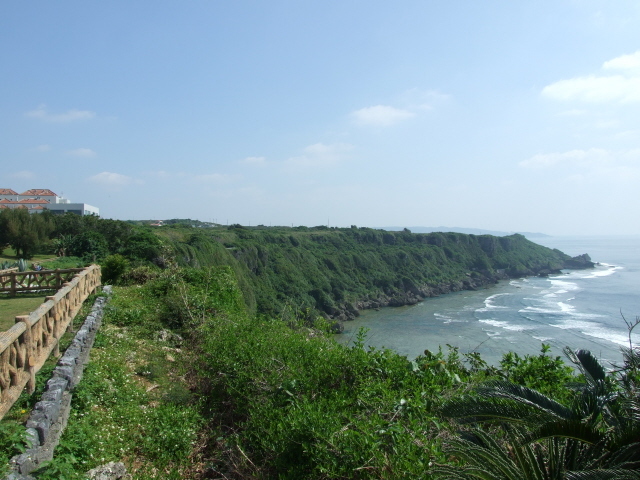 Its scenic beauty makes it hard to imagine what a tragic site this is is: this is where scores of Okinawans committed suicide by flinging themselves off those cliffs, choosing death rather than capture – just as the fanatics of the Japanese military had demanded of the people! Further west beyond the Cornerstones of Peace lies Mabuni Hill, the area where the Battle of Okinawa ended, and where so many died as the US troops advanced on this last pocket of resistance. Today it's the home of the Memorial Path, along which monuments from every single prefecture of Japan (47 in total) are dotted around. It's in fact two paths, one in a straight line leading west, the other following the semi-circle of the coastline cliffs, allowing for more good views over the sea and coast. You can walk out the one way and come back the other, to make it a true round trip. The memorials themselves remain a little obscure to the non-Japanese speaker, but the sheer number of them alone is impressive. Stylistically they vary greatly. Amongst some comparatively bland specimens there are also a few interesting and appealing designs. 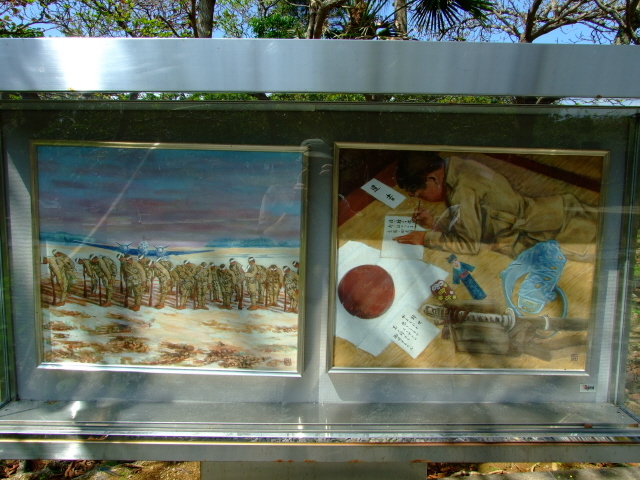 Look out for the one in the shape of a traditional Okinawan "turtle back" tomb – this is to signify the fact that many Okinawans sought shelter in such tombs during the battle (and many died inside – so that they became tombs in a double sense). At the far end of the Memorial Path steps and walkways lead further up and past the Reimei Memorial, and end at what my guide referred to as "Triangular Point", a rocky outcrop overlooking the cliffs and the south-western end of Okinawa; here the path ends and the railings on either side meet in a point rising slightly into the air like the bow of a ship. Just beyond and below down the hillside lies the Kenji Monument for the boys of Okinawa Normal School – but is not visible from here. There may be a path or steps leading down from somewhere off the approach to "Triangular Point", but I didn't see anything – and instead I was later taken there by my guide by car, but "kenji-no-to" is signposted along the Memorial Path. Stay on the path/walkways – signs on trees (in Japanese only – I only know because my guide pointed them out) warn of poisonous snakes that live in the undergrowth here! At the eastern end of Mabuni Hill lies the National Peace Mausoleum, the oldest part of the complex, where the ashes of some 180,000 dead are interred. Beyond this extend the Ceremony Grounds, used in particular on 23 June when an annual memorial service is held here. Back at the Peace Memorial Museum, before going inside, you can first take in the impressive structure of the building itself – a slightly curved white structure topped with countless little red roofs, a central observation tower and spacious colonnades along the front. 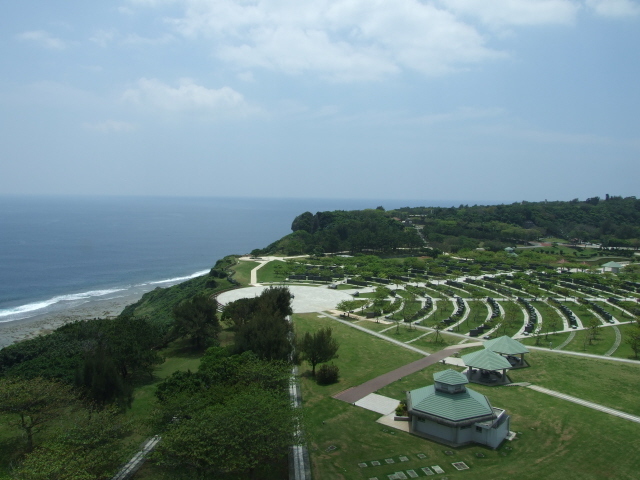 Also part of the Peace Park, and its second most noticeable landmark, is the so-called Okinawa Peace Hall. This is an independent memorial, whose main attraction is a 40 foot (12m) high giant lacquered Buddha figure sitting under the central tower structure. 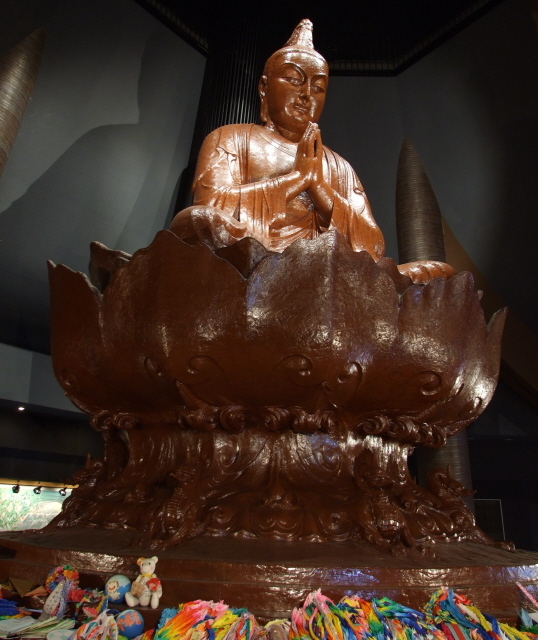 Some 3.5 tons of lacquer are said to have been used in the making of the Buddha! It took a local artist, whose brainchild the Peace Hall is, 18 years to finish the statue. Impressive as this Buddha may be, the rest of the Peace Hall is inferior to the Peace Memorial Museum next door by quite some margin. Other than the giant Buddha, the Peace Hall only displays a few paintings and other abstract exhibits, and a pretty butterfly garden is located at the back behind the main hall, but in terms of dark tourism it doesn't really offer anything. So do ask yourself if you really think you need to see this before you fork out the comparatively hefty extra entrance fee. If you're pressed for time and have to be selective, the Peace Hall is the first element of a visit to the Peace Park that in my view could be omitted. 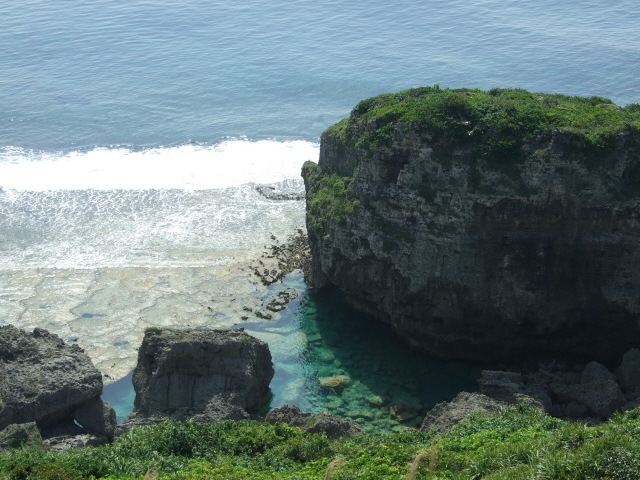 Location: at the southern tip of Okinawa Island, 14 miles (22km) south of Naha (exact figures given by different sources vary for some reason), just off highway 331 between Itoman and the theme park of "Okinawa World" aka "Culture Kingdom Gyokusendo" with its limestone cave. Access and costs: not particularly straightforward, Park free, Museum adequate, Peace Hall overpriced. Details: to get to the Peace Park independently is a bit tricky. There are local buses that get you there, but it's a slow and roundabout journey. From Okinawa's capital Naha take bus No. 89 (some sources also say lines 31, 33 or 46) from Naha Bus Terminal to Itoman terminal (every 20 minutes, ca. 500 Yen one-way), there change to the Gyokusendo Line No. 82 bus to Heiwa-kinen-koen-mae (hourly, ca. 400 Yen one way); pure travel time (without transfers) one hour. If you just want to visit the Peace Park, another option is to take a regular taxi from Naha, which costs ca. 3500 Yen each way. Or get a hire car and drive yourself. By car it takes about 40-50 minutes (depending on traffic), the route is fairly well signposted these days, including transliterated names and some English. If you get lost ask for "haiwa-ki-nen ko-en". Of course, the very best and most flexible and comfortable way of getting around the sights of southern Okinawa is getting a driver-guide to take you around – although that’s predictably expensive (see under Okinawa). As a more economical and also logistically easy and comfortable alternative, there are those tourist coach half-day excursion packages on offer which operate from Naha and take in the Peace Park, Himeyuri and the former Navy underground HQ (but also other bits not of interest to the dark tourist). These tours, however, leave way too little time at the Peace Park, typically a mere 50 minutes. This means, if doing it this way you'd be forced to make your visit radically selective. My recommendation in that case would be to concentrate on the Park's centrepiece and by far most informative element: the Peace Memorial Museum. If there's still time afterwards, make do with a quick walk around the Cornerstones of Peace to the seafront by the eternal flame on the cliff top. But you'd probably have to skip (most of) the Memorial Path and the Peace Hall (altogether). Admission to the permanent exhibition of the Okinawa Prefectural Peace Memorial Museum is 300 Yen ... which is very reasonable for what it offers. But the Peace Hall charges 500 Yen, which is quite overpriced in comparison. The rest of the Peace Park is free. Opening times of the Peace Hall: daily 9 a.m. to 5 p.m. year-round. Time required: Walking the full length of the Memorial Path and right up to "Triangular Point" and back takes about another hour. The Peace Hall can be done in less time. Extra time can be spent at the remaining memorials, the Mausoleum and just for leisure in the Park as such. The Peace Memorial Museum itself requires (at least) about an hour and should be given top priority on any visit to the Park. Allocating roughly half a day in total would allow for a thorough but unhurried visit. Combinations with other dark destinations: The Okinawa Prefectural Peace Memorial Museum forms the centrepiece of the Park and is a must! 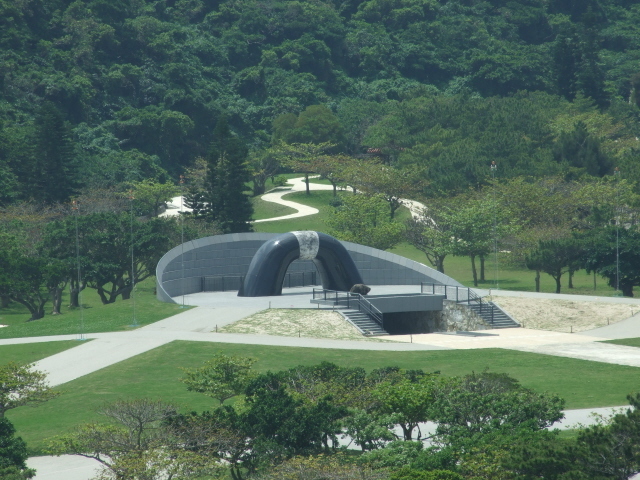 The Kenji Monument for the boys of Okinawa Normal School and its associated cave lie just beyond the hillside of Mabuni Hill to the west. There may be a path or steps leading down from somewhere off the approach to "Triangular Point", but I didn't see anything, though "kenji-no-to" is signposted at some point along the Memorial Path – but instead I was later taken there by my guide by car. But it is close in any case. Not too far, but beyond walking distance, is Himeyuri memorial/museum. In the vicinity of the latter can be found (with guidance) the eerie Todoroki cave. And back closer to Naha a visit to the former Navy underground HQ can complete the full tour of southern Okinawa's dark sights.